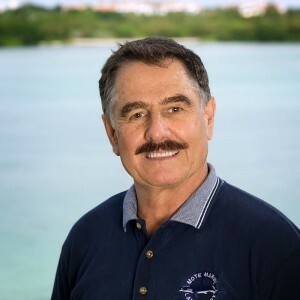 Dr. Richard Pierce is a Senior Scientist for Ecotoxicology and Associate Vice President for Research, Directorate of Environmental health and Ocean Technology, at Mote Marine Laboratory in Sarasota, Florida. He received his Bachelor of Arts and Master of Science in Chemistry from the University of South Florida, and his doctorate in Chemical Oceanography from the University of Rhode Island (URI), GSO, followed by Postdoctoral Research in plant pathology at URI. Pierce was Assistant Professor of Environmental Science at the University of Southern Mississippi and Associate Professor of Chemical Oceanography at Florida Institute of Technology. He joined Mote Marine Laboratory in 1981 as a Senior Scientist and developed the research program in Ecotoxicology, focusing on the source, fate and effects of toxic chemicals in the marine environment. During his tenure at Mote, Pierce has also served as Co-Director, Associate Director, Director of Research and Director of the Center for Ecotoxicology. His studies include harmful algal toxins in air, water and marine organisms, as well as pesticides and other endocrine-disrupting compounds. He has special interests in trophic transfer and bioaccumulation of toxins in shellfish, and strategies for mitigating adverse effects of toxic chemicals on environmental and public health. Pierce has more than 75 published manuscripts and lectures nationally and internationally on his research. He continues to mentor college students as research interns at Mote and by serving on graduate-student research committees at various universities. 2007 Fire, S.F., L.J. Flewelling, J. Naar, M.S. Henry, R.H. Pierce, R.S. Wells. Brevetoxin exposure in bottle nose dolphins (Tursiops truncates) associated with Karenia brevis blooms in Sarasota Bay, Florida. Mar. Biol. 152: 827-834. 2007 Fleming, L.E., B. Kirkjpatrick, L.C. Backer, R.H.Pierce, Et al. Aerosolized Red-Tide Toxins (Brevetoxins) and Asthma. Chest. 131: p. 187-194. 2007 Naar, J. L.J. Flewelling, A. Lenzi, J.P.abbott, A. Granholm, H. Jackoks, D. Gannon, M. Henry, R. Ppierve, D.G. Baden, J. Wolny and J. H. Landsberg. Berevetoxins, like ciguatoxins, are potent ichthyotoxic neurotoxins that accumulate in fish. Toxicon., 50: 707-723. 2007.Twiner M.J., M-Y Bottein-Dechraoui, Z. Wang, C.M. Mikulski, M.S. Henry, R.H. Pierce, G.J. Doucette. Extraction and analysis of lipophilic brevetoxins from the red tide dinoflagellate Karenia brevis. Analytical Biochemistry 369, 128 135. 2006. Pierce, R.H., M.S. Henry, P.C. Blum, S.M. Plakas, H.R. Granade, E.L.E. Jester, K.R. El Said, R.W. Dickey, K.A. Steidinger, P.S. Scott, L.J. Flewelling, J.L.C. Wright. Comparison of Methods for Determination of Brevetoxins and their Metabolites in NSP-Toxic Bivalved Molluscs. Proceedings of the 5th International Conference on Molluscan Shellfish Safety, Galway Ireland, June 14-18, 2004. (Edts. K. Henshilwood, B. Deegan, T. McMahon, C. Cusack, S. Keaveney, J. Silke, M. O'Cinneide, D. Lyons and P. Hess). The Marine Institute, Rinville, Oranmore, Galway, Ireland. p.37-42. 2006. Abraham, A.,S. M. Plakas, Z. Wang, E.L.E. Jester, K.R. El Said, H.R. Granade, M.S. Henry, P.C. Blum, R.H. Pierce and R.W. Dickey, Characterization of Polar brevetoxin derivatives from Karenia brevis cultures and natural blooms. Toxicon, 48. 104-115. 2005 Cheng, Y-S., J.D. McDonald, D. Kracko, C.M. Irving, Y Zhou, R.H. Pierce, M.S. Henry, A. Bourdelais, J. Naar and D.G. Baden. Concentration and particle size of airborne toxic algae (brevetoxin) derived from ocean red tide events. Environ. Sci Technol. 39, 3443-3449. 2005 Cheng, Y-S., Y. Zhou, C.M. Irving, R.H. Pierce, J. Naar, L.C. Backer, L.E. Fleming, B. Kirkpatrick and D.G. Baden, Characterization of marine aerosol for assessment of human exposure to brevetoxins. Environmental Health Perspectives, 113 (5), 638-643. 2005 Cheng, Y-S., T.A. Villareal, Y.Zhou, J.Gao, R.H. Pierve, D. Wetzel, J. Naar, D.G. Baden. Characterization of red tide aerosol on the Texas coast. Harmful Algae, 4, 87-94. 2005 Fleming, L.E., B. Kirkjpatrick, L.C. Backer, R.H.Pierce, Et al. Initial Evaluation of the Effects of Aerosolized Red Tide Toxins (Brevetoxins) in Peresons with Asthma. Env. Health Persp. 113(5): p. 650-657. 2005. Pierce, R.H., M.S. Henry, P.C. Blum and E.M. Mueller. Aerial and Tidal Transport of Mosquito Control Pesticides into the Florida Keys National Marine Sanctuary. Inter. Jour. Tropical Biol. Conserv. 53: 117-125. 2005 Backer LC, Kirkpatrick B, Fleming LE, Cheng YS, Pierce R, Beane JA, Clark R, Johnson D, Wanner A, Tamer R, Baden D. 2005. Occupational Exposure to Aerosolized Brevetoxins during Florida Red Tide Events: Effects on a Healthy Worker Population Environ Health Perspect: Vol. 113, p. 644- 650.2005. 2005 Pierce, R.H., M.S. Henry, P.C. Blum, S.L. Hamel, B. Kirkpatrick, Y.S. Cheng, Y. Zhou, C.M. Irvin, J. Naar, A. Weidner, L.E. Fleming, L.C. Backer, and D.G. Baden. Brevetoxin Composition in Water and Marine Aerosol along a Florida Beach: Assessing Potential Human Exposure to Marine Biotoxins. Harmful Algae. 4, pp. 965-972). 2004 Dickey, R.W., S.M. Plakas, R.H. Pierce, et al. Multi-Laboratory Study of Five Methods for the Determination of Brevetoxins in Shellfish Tissue Extracts. Steidinger, K.A., Landsberg, J.H., Tomas, C.R. and Vargo, G.A. (Eds.). FL. Fish and Wildlife Conserv. Comm. and International Oceanogr. Comm. of UNESCO,. Contrib. 715. p. 549-551. 2004 Fleming, L.E., L.C. Backer, R.H. Pierce, et al. An Epidemiological to Study of Aerosolized Florida Red Tides. Steidinger, K.A., Landsberg, J.H., Tomas, C.R. and Vargo, G.A. (Eds.). Fl. Fish and Wildlife Conserv. Comm. and International Oceanogr. Comm. of UNESCO,. Cont. Fl. Fish and Wildlife Conserv. Comm. and International Oceanogr. Comm. of UNESCO,. Contrib.667. p 508-510. 2004 Kirkpatrick, B., L.E. Fleming, D. Squicciarini, L.C. Backer, R. Clark, W. Abraham, J. Benson, Y-S Cheng, D. Johnson, R. Pierce, J. Zaias, G.D. Bossart and D.G. Baden. Liertature review of Florida red tide: implications for human health effects. Harmful Algae, 3, 99-115. Harmful Algae, 2002. 2002. Steidinger, K.A., Landsberg, J.H., Tomas, C.R. and Vargo, G.A. (Eds.). Fl. Fish and Wildlife Conserv. Comm. and International Oceanogr. Comm. of UNESCO, Cont. 716. p. 294-296. 2004 Pierce, R.H., M.S. Henry, C.J. Higham, P.C. Blum, M.R. Sengco and D.M. Anderson. Removal of harmful algal cells (Karenia brevis) and toxins from seawater culture by clay flocculation. Harmful Algae. 3, 141-148. 2004 Pierce, R.H., D.L. Wetzel, and E.D. Estevez. Charlotte Harbor Initiative: Assessing the Ecological Health of Southwest Florida s Charlotte Harbor Estuary. Ecotox. 13, 274-284.